Regiment/Catrawd: Royal Garrison Artillery, 91st Trench Mortar Bty. Ref No Grave or Memorial / Rhif cyfeirnod bedd: III. B. 1. William Owen Parry was born in 1876. He was probably a twin to sister Mary, (They share the same registration number at Hawarden (HAW/20/39). In the 1881 census they were living with their family in Mancot. The father was William Parry, 35 a coal miner who had been born in Llanasa, Flintshire. He was married to Mary, 34 who had been born in Denbigh, Denbighshire. Their listed children were Margaret J who was 8, William O and Mary were 6 and John was 3. The family was still in Mancot, on the 1891 census.William was 47 and still a coal miner. His wife Mary was 46. The listed children still in the household were William O, 16 who was a Brickyard Labourer, Mary, also 16 was “at home”. John, 13 and Thomas, 8 were scholars and baby Wilfred was 2. In 1901 William Parry, 56, was a Puddler,( although that had been crossed out). Mary, 56, was described as an’ Ironworks Labourer’ which hardly seems likely and is probably an enumerator’s error. John, 23 was a Farm Labourer, Thomas 18 was an Ironworks Labourer, Wilfred, was12. William was missing from this census and I cannot find him anywhere. She stated on the census form that she had been married 39 years. Seven children had been born to her but 1 had died. There were two listed ‘children’ in the household, William Owen was single, 37 and an Iron worker. John was single, 34 and , a Chemical Labourer. On the 1911 census son Wilfred Parry, single and 22, occupation, a Takeroff on a Corrugating Machine, born Mancott, Flintshire, was living, I believe, as a lodger at 14 Church View, Pentre with a family named Bungay, Timothy,49 & Ellen, 41 and their two daughters, Hilda, 17 and Ellen, 15. Also in the household was another Lodger Frederick Hodgkinson, single, 24, a Bar Drager, born in Birmingham. Wilfred Parry is William Owen’s Brother, Please read his notes by clicking on the link. I cannot find a Flintshire WW1 Index Card for William Owen Parry, neither “Living” nor “Fallen”. UK, Soldiers Died in the Great War, 1914-1919 accessible on www.ancestry.co.uk confirms his regimental information and tells us that he was born and living in Hawarden and that he enlisted in Chester. His medal card, also on ‘Ancestry’ details his medals and tells us that his first Theatre of War was France and he entered it on 10th March 1915. He was killed 6 months later. Yet another name has been added to the list of gallant young men from Hawarden who have lost their lives fighting for their country. 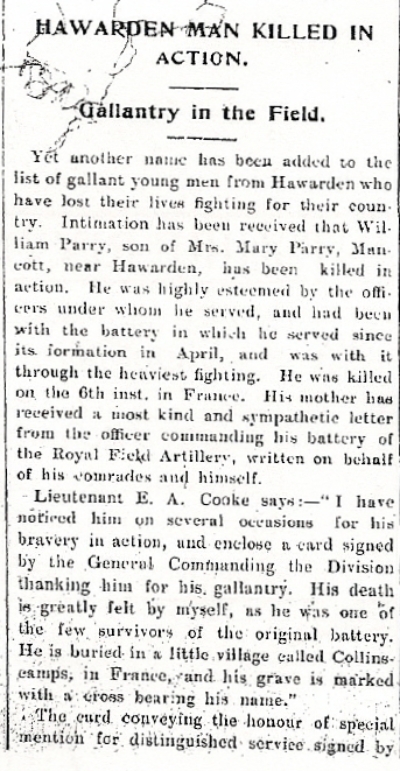 Intimation has been received that William Parry, son of Mrs. Mary Parry, Mancott, near Hawarden, has been killed in action. 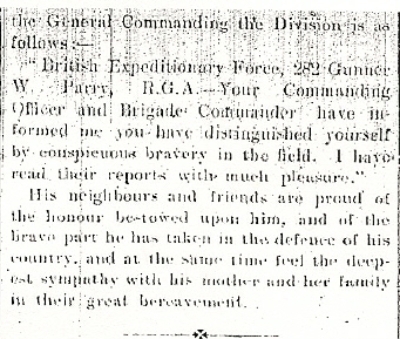 He was highly respected by the officers under whom he served, and had been with the battery in which he served since it’s formation in April, and was with it through the heaviest fighting. He was killed on the 6th inst. In France. His neighbours and friends are proud of the honour bestowed on him, and of the brave part he has taken in the defence of his country, and at the same time feel the deepest sympathy with his mother and her family in their great bereavement.